Vinayaka's Kitchen: Ginger Garlic Paste (Homemade) - இஞ்சி பூண்டு விழுது - How-to? Ginger Garlic Paste (Homemade) - இஞ்சி பூண்டு விழுது - How-to? 1. Peel off skin of Ginger and Garlic skin and add it to a blender. (Peeling off Garlic skin is a headache. To do it easily follow the tips shared in our video). 2. Blend it slowly until the paste becomes smooth. Add oil if you want to preserve the paste for more than a month. 3. Transfer it to an airtight container and store it in the fridge. #2: Add oil if you want to preserve the paste for more than a month. #3: Use green chilli in case if you want to make the paste spicy. 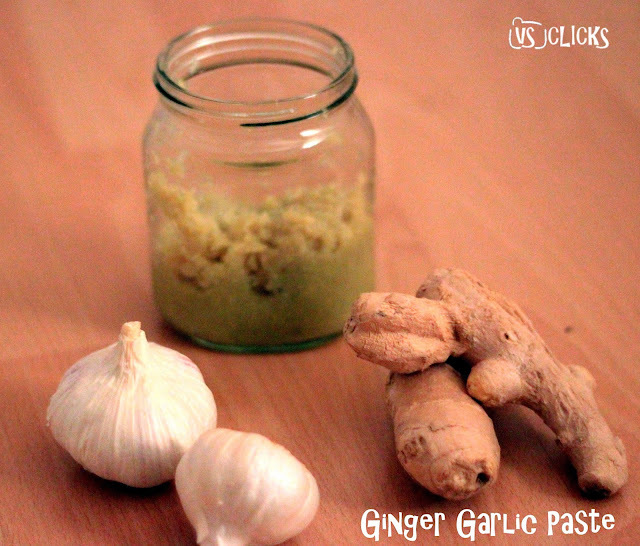 Ginger Garlic Paste is an important item in Indian Dishes. It transforms the flavor of the recipe to a higher level. Do try it out and you are welcome to post the pics here.